A tool set has an incredibly high value in practicality and functionality; this means it makes the perfect promotional gift, as it is equipped with its own value even without the promotional effect. Allbranded however makes sure the advertising is also optimised for your consideration, by making use of high-quality printing and allowing for a great range of customisation. So if you are looking for your company to make a long lasting positive impression then look no further! We at allbranded specialise in marketing strategies and know how to make you stand out among the rest! The tool set primarily presents a large practical helping image; a quality that all businesses strive for. So with every use, your corporate logo will stick out to its user and the association will be formed for the long term, as a business that knows what its customers need. It allows the appealing of a vast target audience as their practical use can be applied both at home as well as in work place. For more promotional products, check out our keyrings, pens, pencils, eco-friendly bags, mugs, torches, umbrellas, knives, usb-sticks, clocks and promotional knives. As you can imagine, tools have been made use of for a long period within human history, as a way to advance civilisations and tools acting as its enabler. In fact, the history goes so far back that it predates the existence of humans as anthropologists say these were even in use by chimpanzees! The very first tool was natural; sticks and stones for predatory purposes (hunting). Meanwhile it is Ethiopia that most likely saw tools made from stone; the hand axe was the first of its kind, 2.6 million years ago. Ancient Greece saw the rise in these with the use of waterwheels and windmills and the building of such. Romans with the increase of specialised roles such as carpenters and builders paved a path for specialised tools for turning wood into practical products including saws and axes. Naturally the industrial revolution led to the surge of production and demand. Whether it is a way to thank your existing customers and employees or promote incentives for newcomers, the promotional tool kits will communicate the message most effectively, equipped with its aesthetics and practical use. As will our vast selection of promotional keyrings, pens, pencils, lanyards, mugs, torches, umbrellas, knives, eco-friendly bags usb-sticks, clocks and promotional plans. All products can be customised and are guaranteed to have advertising appeal for anyone who bags our high-quality sets. Prepare yourself for cheap prices and perform your advertising campaign in a profitable way that bags you plenty of attention. Give presents to your customers in form of high quality promotional tool kits (including screwdrivers, measuring tape etc.) and look forward to positive responses, as well as an increase of delighted new customers. If you have further questions regarding your promotional DIY and gardening products, we at allbranded are there to help you at any time. Decide to go for our reliable allbranded shop and look forward to start the distribution of your customised giveaways in just a few workdays. If your company is specialised in construction and handcraft, branded tool sets are the perfect promo gift (as are our keyrings, pens, mugs, eco-friendly bags and numerous other accessories), as you can show your field of action in form of your merchandising. 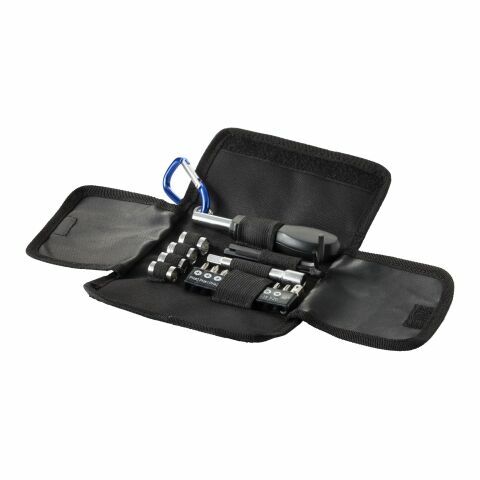 But even if your company has a totally different area of activity, a tool set is still a great universal promotional product. Giveaway useful and innovative promotional products to your customers that will most certainly find vast use in everyday life. Every household needs a variety of tools. Your customers will therefore be thankful for a toolset and will keep you and your company in mind. Say no to familiar promotional products that nobody needs and use efficient giveaways instead. You’ll find high quality tool sets in our online store in many forms and sizes. Why not browse through our additional branded pens, torches and bags for extra measure?